Ten healthy male volunteers between 26 and 50 years of age with moderate hair loss were enrolled in a 12 week study. Study volunteers were instructed to massage Regenscalp™ on their scalp daily before bedtime, while refraining from the use of any other comparable treatments. The study was conducted under the supervision of a dermatologist specializing in hair loss. At the beginning of the study, each volunteer had an area of hair around the crown cut very close to the scalp in order to take an initial photograph of their hair called a phototrichogram. Three days later, a second photograph was taken of this same cut area. By superimposing the photographs for analysis by a specialized computer, the relative percentage of hairs in the anagenic, catagenic and telogenic phases of the hair cycle could be recorded for comparison later in the trial. All study volunteers were started on Regenscalp™ after completing this baseline phototrichogram protocol. During the eights and twelfth week of the study, the same photographic protocol initially performed at the beginning of the study was repeated in order to determine if there was any change in hair cycle, hair volume or hair regrowth rate. Since an abnormally dry or oily scalp can contribute to hair loss, it would be beneficial if oil secretion could be normalized in study participants. The rate of sebum production in all study volunteers was measured using “seba tape” at the beginning of the study and then after twelve weeks of Regenscalp™ application. By applying the tape patches near the hairline and conducting a computer-based image analysis of the used tape, researchers could determine the number of active sebaceous glands, their distribution and their size. Hair cycle analysis was assessed by special photographic enlargements of a representative area of active hair loss, and subjected to computer analysis. At 8 weeks, 95% of men treated with Regenscalp™ experienced an increase in hair growth and an average 80% reduction in hair loss. Volunteer self-assessment yielded comparable results. 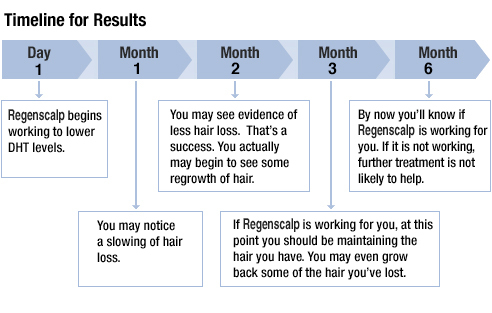 After twelve weeks, hair thickness increased by 69%, while the hair regrowth rate increased 33%. Regrowth Rate combines changes in hair count, hair thickness and hair growth into one value. ALL study participants with self-described "thin hair" categorized their hair as thicker at trial end. Seborrhea is a disease of the sebaceous gland that results in a change in the quality and amount of the gland’s secretions, called sebum. The oily coating, crusts or scales that develop on the scalp create a hostile environment for hair growth and can be a significant cause of hair loss in many individuals. Twelve weeks of study revealed a 62% reduction in sebum production for volunteers using Regenscalp™. Of the two types of human Demodex parasites, the one that lives in the sebaceous glands of the scalp can contribute to hair loss. When the Demodex population is low, the parasite has no significant impact on hair loss. But as the population increases, Demodex’s impact on the sebaceous gland’s ability to function creates an overly dry and hostile environment that favors hair loss. Regenscalp™, with colloidal sulfur, promotes hair maintenance by controlling the Demodex population. Research findings prove that Regenscalp™ reduces the Demodex population by an average of 32%. Standardized photographs were rated by an independent physician/panel for an increase or decrease in scalp hair. No participants were found to show a visible decrease in scalp hair. The photographs below are of a clinical study subject who demonstrated excellent results after using Regenscalp™ for 12 weeks. Comment: It has been indicated that Regenscalp™ has effectively controlled anterior mid-scalp hair loss. PROPECIA® is a brand of MERCK & Co., Inc.
ROGAINE® is a brand of McNEIL-PPC, Inc.
Brands referenced are trademarks of their respective companies. Comment: DHT, or dihydrotestosterone, is the principal cause of male pattern baldness, otherwise known as androgenetic alopecia. Research suggests that DHT at the hair follicle suppresses the release of growth factors needed for hair growth and maintenance. Continued exposure to DHT in predisposed individuals leads to gradual thinning and loss of hair. Removal of DHT from the hair follicle provides for indirect suppression of the telogenic, and to a lesser extent, the catagenic phase of the hair cycle.